March Drought Update: A North-South Divide, and Where's the Snow? As others have written -- notably Paul Rogers, managing editor of KQED's Science unit and environmental writer for the San Jose Mercury News -- one of the strong patterns that's emerged this winter is an atypical divide between how much precipitation Northern California has gotten this "wet" season and how much is falling south of the latitude of, say, San Jose. Just to be clear, climatic records show that Northern California gets more rain than Southern California, period. But this winter, many locations in Northern California are at or even a little above their seasonal average for precipitation, thanks mostly to a very wet December, while to the south, many locations are lagging far behind seasonal rainfall. One result of this general pattern is that there's been a healthy increase in storage at big reservoirs in Northern California. Shasta Lake, the state's biggest reservoir, is at 78 percent of average for this date (though it's just 58 percent full). Lake Oroville, the second-biggest storage facility, is at 70 percent of average and 49 percent full. Both are running far ahead of storage levels at this time last year. Folsom Lake is actually above average, at 103 percent. But to the south, the bigger reservoirs are mostly in abysmal shape. New Melones, on the Stanislaus River and the state's fourth-biggest storage facility, is 25 percent full and 48 percent of average. Lake Don Pedro, the No. 5 reservoir, is 43 percent full and 60 percent of normal. (See the Department of Water Resources daily summary of major reservoirs. Of the state's 10 biggest reservoirs, none is in as bad shape as Lake McClure, on the Merced River downstream from Yosemite. A month ago, February 3, Lake McClure fell to its lowest level since it was filled in the 1960s. Per statistics from the state Department of Water Resources, its volume shrank to 63,489 acre-feet (remember, capacity is 1 million) and its surface was at 585.99 feet above sea level. That broke a record set during the six-year drought of 1986-1992, when the lake fell to 66,228 acre-feet, 588.48 surface elevation. And here's an update to the update: The Department of Water Resources conducted its third monthly snow survey of the season earlier Tuesday. The measurement, taken in a meadow near Echo Summit on U.S. 50, high above Lake Tahoe, confirmed what the state's network of electronic monitoring stations has been reporting on a daily basis: the Sierra snowpack remains shockingly thin. At the survey location itself, near Phillips Station, the water content of the snow is just 5 percent of its historical March 3 average. DWR said its network of 103 stations have a composite average of 19 percent of the snow-water content typical for this time of year. The Department notes that the only year in which snow was as scant as it is now was 1991. 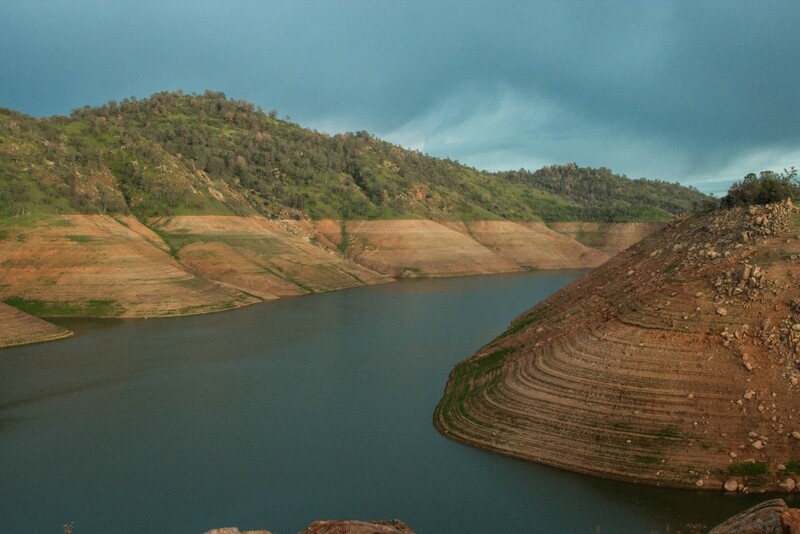 Then, the state's water supply was saved by a "Miracle March" deluge that built up the snowpack and also dramatically increased the tiny volume of water stored in Lake McClure. To play forecast-watcher for a moment, NOAA's Climate Prediction Center's six-to-10-day outlook is showing a relatively high chance of above-median precipitation for most of California. When might we see rain instead of just a forecast of rain? The National Weather Service San Francisco Bay Area office in Monterey says models are pointing to the possibility of a wet storm arriving around the middle of next week. Between now and then, a familiar word: dry.